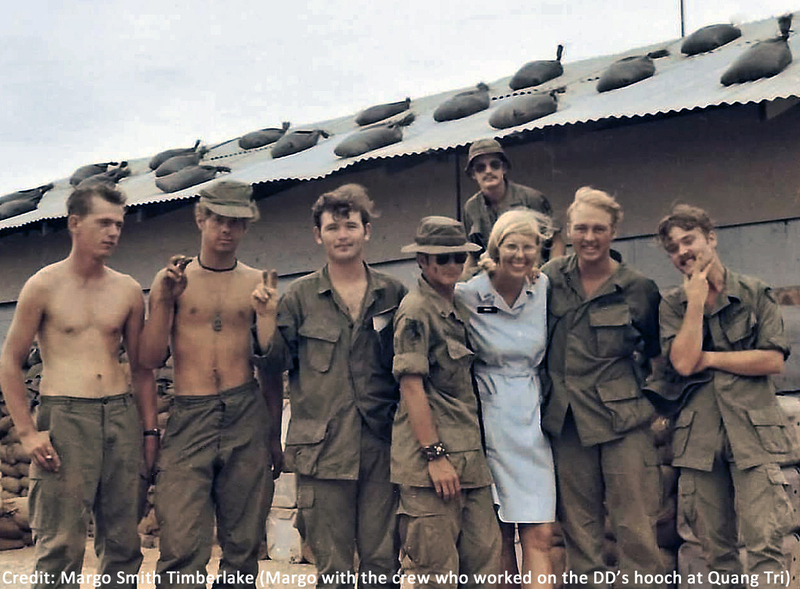 In our 40th edition of the Donut Dollie Detail, Margo tells how she went to Vietnam to support the men there, how she had a close call at a firebase she had just left, and that one of her fondest memories was playing Santa at firebases around Chu Lai. I felt that it wasn’t about the war or politics, it was the opportunity to support the men who were there and just to let them know that someone cared about them. I served in Vietnam from August, 1970 – August, 1971. I was stationed for 2 months at Cam Ranh Air Force Base, then 5 months in Chu Lai and finally 5 months in Quang Tri. On the bases where we had a Red Cross recreation center, we took turns staffing them. When we were stationed on bases where there was no recreation center or we weren’t working the center, we would fly out to 3-4 fire bases to take our games on the road. In the afternoons we would visit the hospitals. Evenings were often spent at a stand down party or at the officer’s club. We were having lunch on one of the firebases (I don’t remember which one) and our chopper came early to pick us up because they had an emergency op to run. So when we left, the guys also left and cleared the area. About 10 minutes later a mortar round came in and completely destroyed where we were sitting. I guess we were all very lucky. My only injury came when I was running to the shelter during incoming and tripped and fell in a ditch! When we visited the hospitals, the men were usually newly injured. They were not ready yet for sympathy, so we had to adopt a tone of “why did you have to go step on a landmine? That was pretty dumb…” Then we would go back to our hootch and cry. Surprisingly the transition was not difficult. I had wonderful support from my family and friends. But another Donut Dollie and I also left the states after about a month and backpacked, hitch hiked and traveled by Eurail through Europe for 4 months, so we had plenty of time to decompress and process our feelings. We were all young and idealistic. We wanted to make a difference. And most of us felt that this was our opportunity to do something “different” and meaningful before we settled into what we expected to be mundane lives. I know that veteran’s on the whole seem to have enjoyed having us as a diversion from their other memories of Vietnam. I seldom mention that I was there so I have not gotten any recent feedback from a vet. My uncle, a former commandant at a military school in Alabama had passed, and at his funeral I met a former JAG officer who had been stationed at Cam Ranh Bay when I was there. He thanked me for being there and helping to brighten his day. It was nice to be remembered in such a good way. While my cousin and I were arranging to have a military funeral for my uncle, the current commandant of the military school, Col. Roy Berwick, had a certificate on his wall from Vietnam. I commented on it and mentioned I had been there then too. His reaction and comments were so positive, I had to mention it here. 1) Christmas in the bush around Chu Lai, there was a cease fire that day, so we were choppered right out to areas we never would have gone any other time. I think we went to 3 different places. These guys were not even able to get back to a firebase for Christmas, so we took Christmas to them. We put pretty pitiful homemade paper decorations on whatever “Charlie Brown” tree we could find, sang carols and visited. I had on a Santa top and the guys would come sit on my lap, whisper their Christmas wishes and get a Red Cross goodie bag. 3) Riding in helicopters at low level with the doors open! 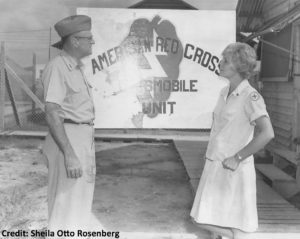 In our 39th edition of the Donut Dollie Detail, Cathie tells how her Aunt’s work with the American Red Cross prompted her to join the “club mobile program” in South Korea, how she was one of the few Donut Dollies who actually served donuts to the men, and that she got back so much more than she gave from the men in Korea. What prompted you to join the SRAO (Supplemental Recreation Activities Overseas) program and want to go to Korea? I graduated from college in June, 1972 and had no idea what I wanted to do with my life, career-wise. 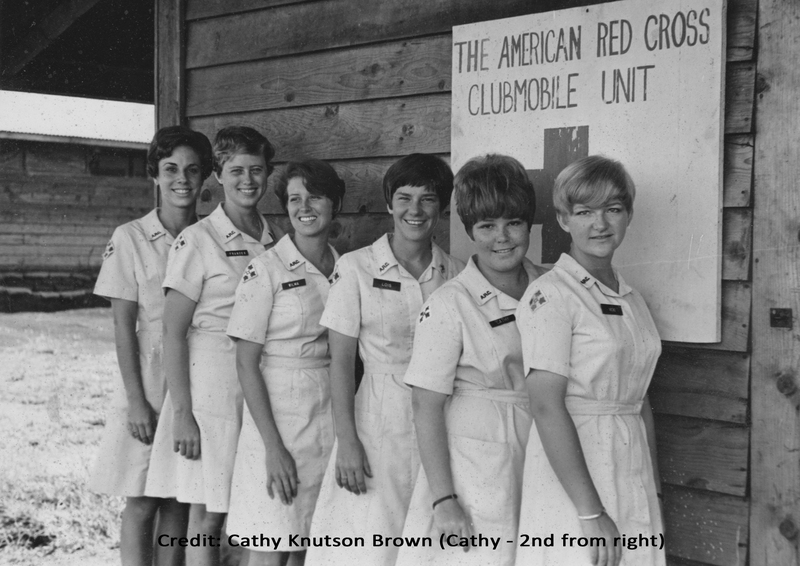 My aunt was then National Director for Service to Military and Veterans Hospitals at the American Red Cross in Washington, DC, and suggested that their “clubmobile program” might give me a chance to sort myself out. Maybe she thought it might mature me a little too. I had never been to Asia and that sounded interesting too. When and where were you stationed in Korea? Did you go by a nickname? In July, 1972 I was stationed at Camp Casey in South Korea for a couple of months, then was promoted to unit director at Camp Howze and served there until February, 1973, at which time they were shutting down the Donut Dollie program and I was transferred to Walter Reed Army Medial Center in Bethesda, MD to be a Recreation Therapist. I was known as Cathie while serving in Korea. What was a routine day like in Korea? Our office was right next to the hooch we lived in at Camp Casey, so we fell out of bed, into our uniforms and walked over to the office. I was assigned the task of managing supplies for the bakers at Camp Casey, so sometimes I would inventory their stuff. Eventually I discovered that they were selling the chocolate we bought for the icing for our Friday donuts on the black market – it was astounding how much chocolate we were going through! But the bakers were usually finished frying the donuts by the time we got in, and had all the bags of donuts ready to go. We would call each unit we were supposed to visit that day, to confirm they weren’t out in the field or otherwise unavailable, and then head out in our deuce and a half or jeep or whatever vehicle we had that day. At Camp Casey, we travelled by helicopter to some of our stops . At Camp Howze, there was a weekly stop at “Magic Mountain,” a radio installation, where they had to come down the mountain and pick us up in their jeep. 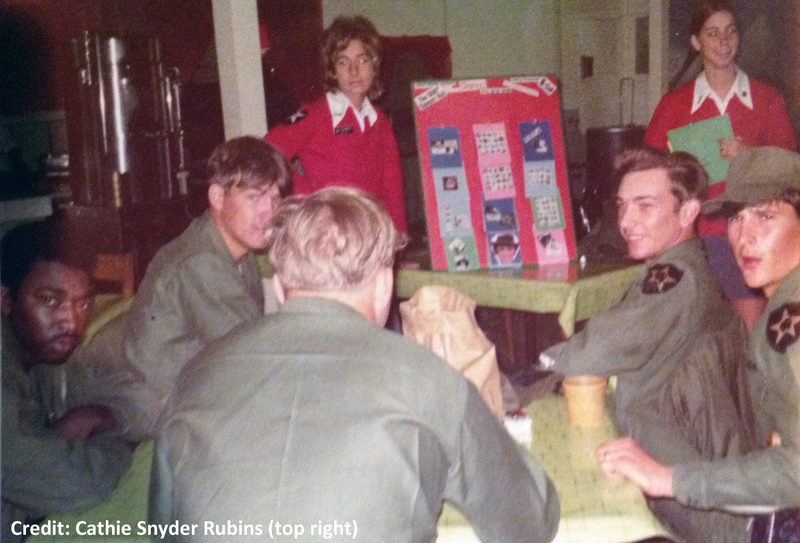 Often we ate at the mess halls, and at Thanksgiving and Christmas we split up so we could eat the holiday meal with several units – I ate Thanksgiving turkey up in the DMZ in 1972. We were a small unit at Camp Howze (just 4 of us) and became good friends with the men who drove us. No – our drivers were always soooooo careful with us! They seemed to love the assignment. Were you ever injured while in Korea? I only visited one MASH unit in Korea, but Walter Reed was a difficult, amazing experience, as I was assigned pediatrics (children dying from fatal diseases), oncology (adults dying from cancer), and orthopedics (guys with amputations). I remember one soldier who had stepped on a land mine and had both feet blown off; his hobby before serving had been square dancing. That was a big wake-up call to me about how hard life could be. Everyone (both the Dollies and the men we served) had a different reason to be there and came from different backgrounds, but I learned that even though we are all different in some ways, we are more alike than we are different. The women I served with wanted to be useful and kind, and that’s a pretty good goal (and unusual these days). 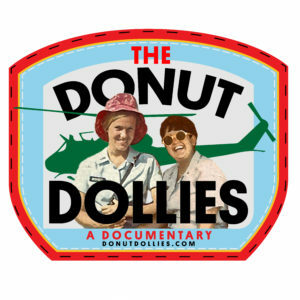 I think the Donut Dollies in Vietnam must have been an amazing sight to those guys and that the Vets thought they were extremely brave to go. 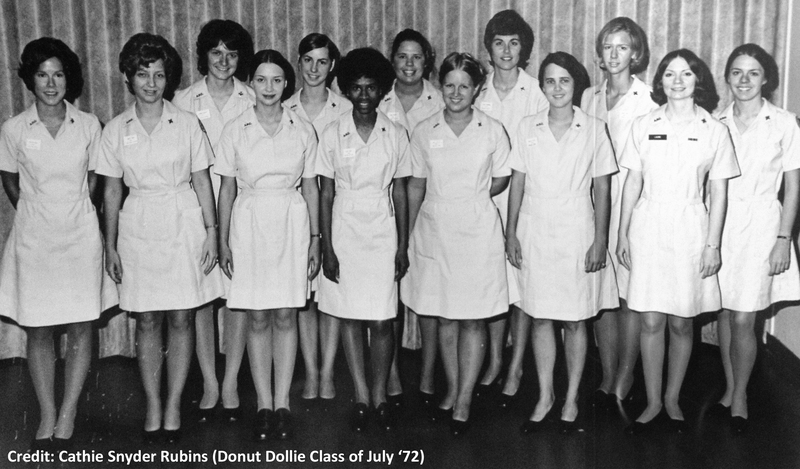 I have never spoken to any vets about my time as a Donut Dollie. I imagine they would think I was lucky to have all the options I did, and maybe silly to go to South Korea. I remember meeting guys in Korea who had been given a choice by the judge: the Army or jail. OK, I had waaaaaaay better choices than that. 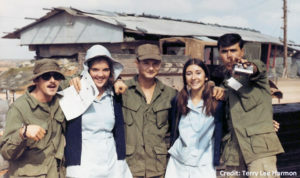 What are your fondest or most interesting memories of your time serving in Korea? I loved the women I served with – they were an energetic, curious group. I had some not so great experiences in Korea, too, but all in all I learned a tremendous amount and feel it has enriched my understanding of people, the world and myself. Who knew Red Cross was doing so much good just by sending out a bunch of friendly, nurturing faces? It’s led me, in my sixties, to start standing up at ball games when they honor those who served with the military. I was always proud to be able to think that I had served (sort of), as I came from a family where EVERYONE had been big-time military during WWII – an uncle was on staff at the Pentagon, other uncles were commanding troops in Europe, my aunt was career Red Cross, acting as Eleanor Roosevelt’s on-site guide during her visit to the Philippines and eventually retiring as national director of service to military hospitals. My mom and dad met in Australia where they were both on R&R from the Philippines, her with Red Cross doing social work and him as an Army officer, building fuel dumps for planes! But even though I was my family’s resident hippy peacenik, I was forgiven my disinterest in a military career. But now I know that’s my service wasn’t nothing either. For the men to see a friendly face, in a ward or a war zone or when they just needed help and didn’t know who else to ask, that’s what the Donut Dollies were there for, and I got back so much more than I gave, each time. In our 38th edition of the Donut Dollie Detail, Cathy tells her experience during an incoming fire event for the first time, how visiting soldiers in hospitals were some of the most challenging experiences and how she enjoyed chopper rides over the rice paddies. One of my sorority sisters from FSU had gone and her reports sounded so interesting. I had one other job offer, but I was just more intrigued with the idea of serving my country… and so I went! 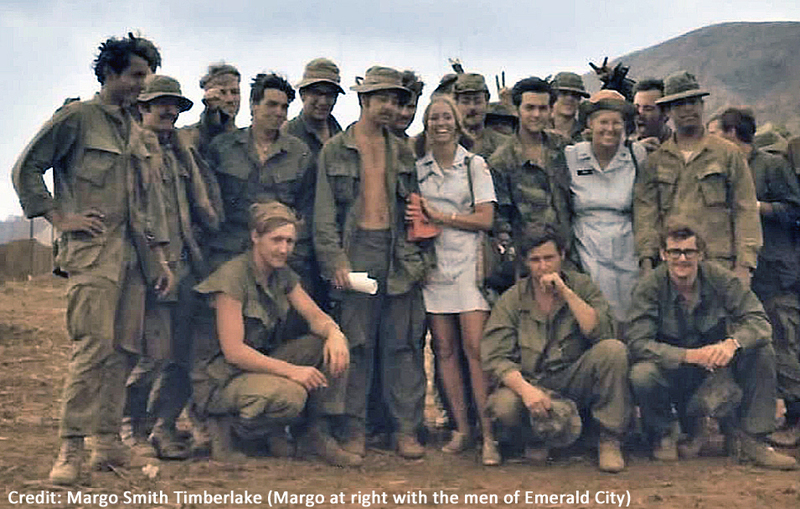 I was stationed with the 4th Infantry Division in Pleiku from April – November, 1968, then with the 35th Tactical Fighter Wing in Phan Rang from Novemeber, 1968 – April, 1969. One nickname was Pleiku Cathy; another was Knuts (Ca-noots). First off, there was NO routine day in Vietnam!!! In the Central Highlands of Pleiku we were in an active war zone. Our general, Major General Charles P. Stone was very supportive of our work and made sure that we were able to get out to the fire bases every day. Morale was very important to him and he understood our role and responsibilities. Generally we would rise and shine and go down to the chopper pad and wait for a ride. We would visit 3-4 fire support bases then back home around dusk. Then hit a round of events in the evening… BBQ’s or other gatherings, visiting with the men, being cheerful, encouraging, listening. In Phan Rang we operated a recreation center, which had different requirements for programming and such. 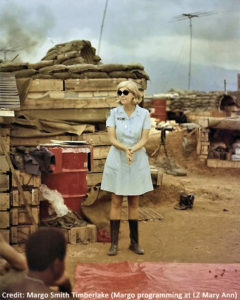 We also had a radio program and would visit troops in the field. Phan Rang was on the coast and there was a different vibe — less war-like than in the Central Highlands. Just once, though I’ve never spoken of it. A colonel wanted us to visit a motor platoon that had been in the boonies for months. It was not approved, but my partner and I were game. We touched down and started visiting with the guys, when we started experiencing incoming fire… in the middle of the afternoon! One of the guys picked me up and threw me down in a bunker and jumped on top of me. Our guys started returning fire… then gun ships zoomed in and the enemy shooting ended. Yikes!!! I have palpitations just remembering this!!!! This was the hardest for me, especially in the quadriplegic wards. Our job was to be endlessly cheerful as we visited those with devastating injuries. I returned home to San Francisco and war protests!!! In the year away so much had changed in America… it was disorienting. 1968 has been referred to as a year of seismic change in our country: the murders of Martin Luther King and Bobby Kennedy, the tumultuous Democratic convention in Chicago… and we were in the midst of it all. For the most part these young women were earnest and devoted patriots… putting service above self. Fresh faced, earnest and full of pizzazz. I would imagine that most went on to lead extraordinary lives… I know I did!!! In all the years I have only experienced gratitude from those who served. 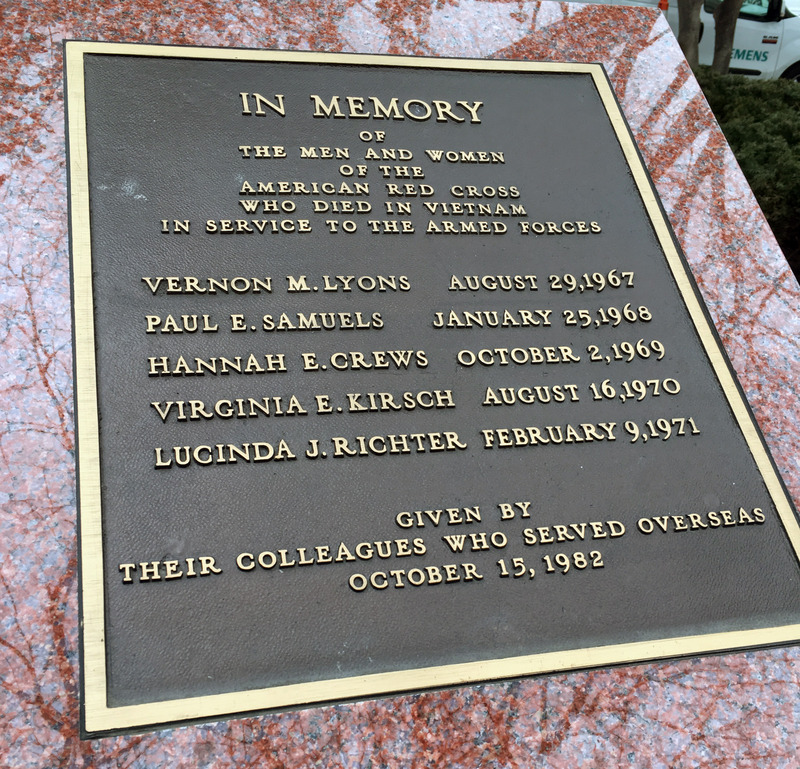 In the 70’s I traveled often by plane for business and would connect with fellow passengers (male) and when they learned I had been in Vietnam they would open up and pour out their stories… because I could somewhat understand their experiences. Chopper rides on crisp mornings riding over rice paddies; sailing on the South China Sea with the 2nd Squadron RAAF; playing my ukulele and singing with the children at the leprosarium in Kontum run by the French nuns; scrounging supplies for the recreation center; and serving holiday dinners to thousands of troops. 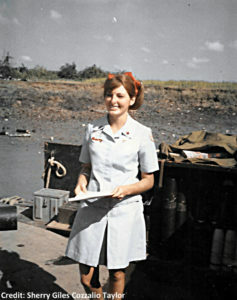 In our 37th edition of the Donut Dollie Detail, Jackie tells how her mother’s service as a Donut Dollie in WWII prompted her to go to Vietnam, how during the Tet Offensive a mortar round landed right behind her trailer, and how she appreciates the opportunity to have experienced the most significant experience of her generation. My mother was a Donut Dollie in WWII and that’s how she met my father! It was part of my family story growing up, so when the opportunity came along for Vietnam, I couldn’t resist. 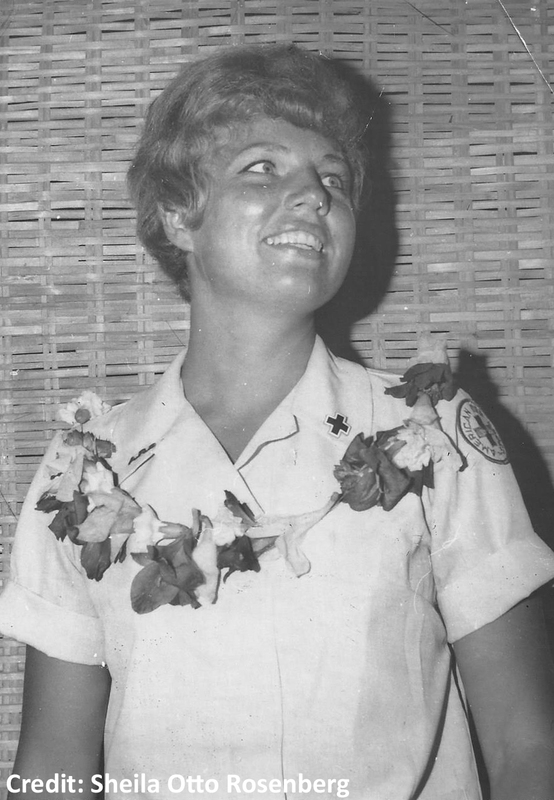 My mother was actually the person who told me Red Cross was looking for young women to go to Vietnam. 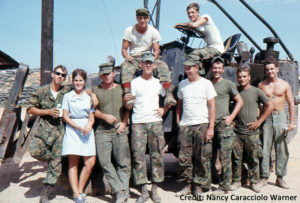 I was stationed at Lai Khe from July – November 1967, at Chu Lai from November – March 1968, and Danang from March – July 1968. I was always known as Jackie, but in Lai Khe some of the other girls called me “Dud”, making it the opposite of my last name (Lively). 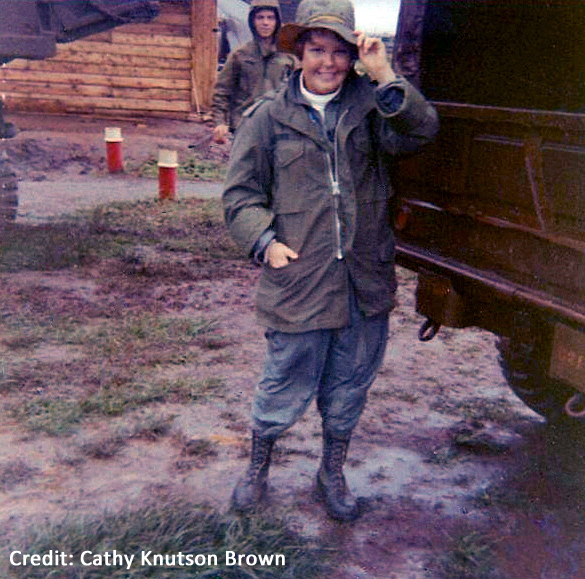 As other women have probably said, there really wasn’t a routine day, but we either worked in the office creating programs, rode by jeep or truck or flew by helicopter out to the field to do a program, or worked in the recreation center, if there was one. We had a center in Lai Khe and Danang, but just an office in Chu Lai. 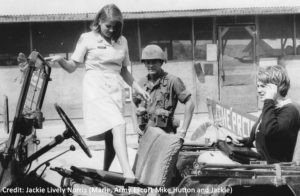 I had the same experience Linnie Stone described in Lai Khe, which never felt like a serious threat – but of course, I had just gotten to Vietnam, and was a naïve 21-year old, so I probably didn’t realize the danger. A closer call happened in Chu Lai, where we lived in a trailer on the same street as the generals. One night I was writing a letter home to my parents, and it was during the infamous Tet Offensive of 1968. I had just written, “You’ll probably hear about things happening over here that might worry you because of the Tet Offensive, but don’t worry about me… I’m very well protected”. Right after I wrote those words, a mortar round landed right behind our trailer. I quickly crawled under my bed (they had told us that was an option), and then some soldiers came and took us into the bunker across the street for safety. We spent a number of nights in that bunker during the Tet Offensive! It was always both sobering and heartwarming. Sobering, obviously, because of the shape some of the GI’s were in, but heartwarming because they always seemed so happy to have us there. For me, it was probably easier than for most of the Donut Dollies. I was asked to do a 4-month recruitment tour around the US after I returned, so I got to spend those months talking about my experience. I have realized since then that being able to do that gave me an opportunity to get a lot of my feelings out and I have not suffered from any long term stress reactions like some of the women did. I also learned to put the year behind me, grow from the experience, and move on. I know some women had a much harder time doing that than I did. I also worked for the Red Cross in a military hospital for a year, and then several years later, went to work for the Red Cross chapter in Denver, where, as a retiree, I’m still heavily involved as a volunteer today. 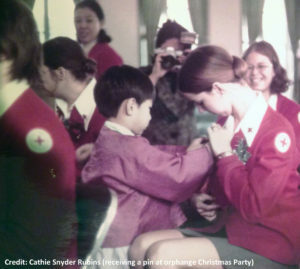 I have always felt I owe the Red Cross a lot for the investment they made in me as a young staff member. We were all young women looking for a life-expanding experience. In most cases we were just out of college, and this was an adventure and a way to start our adult work life. For me, it was life changing, and set me on a path of nonprofit work for the rest of my career. It developed my self confidence in ways that no other post-college experience could probably have done for me. I will always be grateful for that year and will never forget it. I think we each had our own experiences, some better than others, but I would be willing to bet that it was life-changing for all of us. We were there because the guys were there, and we took that very seriously. Every veteran I have ever met has expressed his appreciation for my service… it’s the first thing they say! They were so appreciative of us while we were there, and have always expressed their feelings to us when we meet. 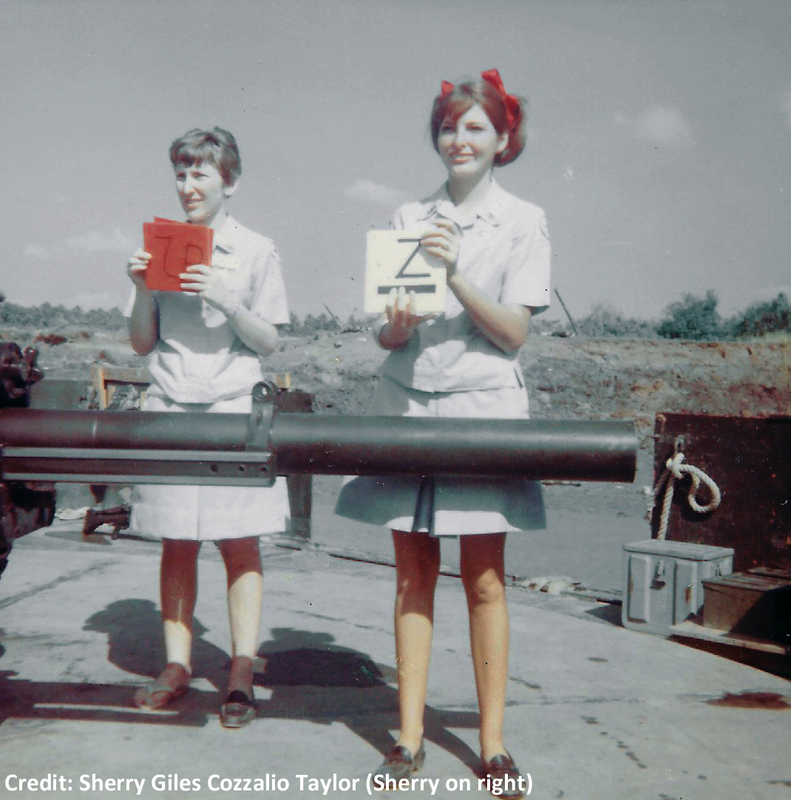 I just wish all the Vietnam Veterans had received the kind of of appreciation from people in the the US that they have always shown to us Donut Dollies. The opportunity to experience the most significant experience of my generation, and the people – both the women I served with and the soldiers we served. Having amazingly fun experiences as well as sobering, emotional experiences in the same place. 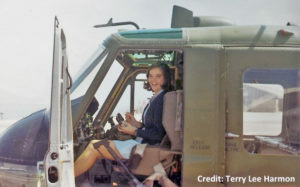 In our thirty sixth edition of the Donut Dollie Detail, Jenny tells how even though she wasn’t eligible for the draft, she wanted to support her male peers who were drafted, that 20-years after the fact she learned that a Chinook helicopter she was flying in had come under fire, and that she had a concerning encounter with a unit’s pet. 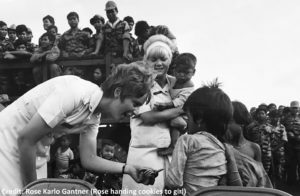 What prompted you to join the SRAO and want to go to Vietnam? As a female I wasn’t subject to the draft, and I felt kind of bad about that. I wanted to try, in some way to help with the awful situation that my male peers were subject to. I also wanted adventure. 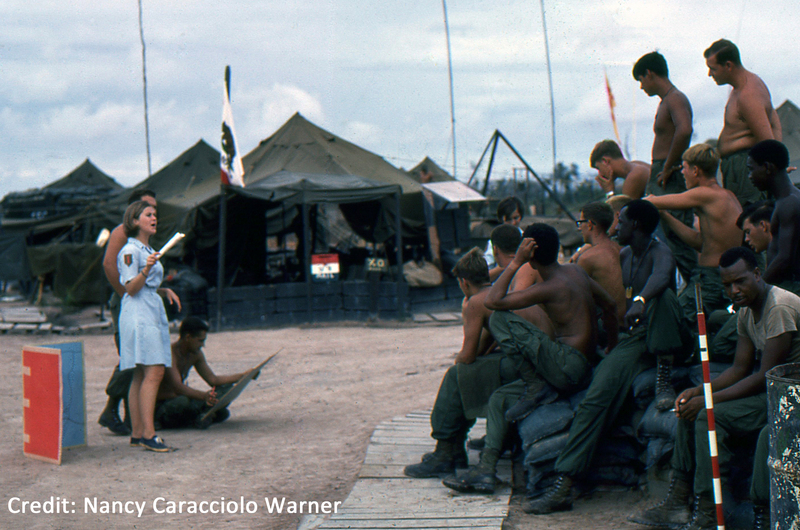 Where were you stationed in Vietnam? Did you go by a nickname? I was first stationed at Dong Ba Thin and the unit was closed in February, 1969 when the Recreation Center’s materials were sent to Tuy Hoa with two of the Dong Ba Thin Donut Dollies. 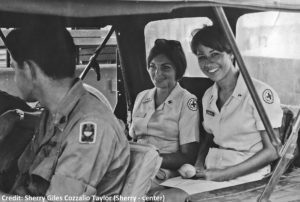 These two (including myself) became two of the four ARC Girls who opened the Tuy Hoa Red Cross unit, becoming the first women to live there on base. I was then transferred to Cam Ranh Air Base and then onto the Fourth Infantry Division in the Central Highlands (Camp Enari). 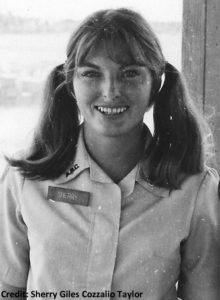 I went by the nickname “Jenny” except for the first month, when my issued name tag said “Jen.” I asked for the change to Jenny, too many people thought “Jen” was “Jan” or “Jean”. For mobile runs, either by road (jeep or truck) or air (chopper) we got up very early and came home at the end of the day, unless having to R.O.N. (remain overnight) due to unexpected weather somewhere. We visited as many units as possible. In the Highlands, these would be artillery units on a firebase, plus the infantry units who were “in” from patrol. These were guys living underground or in sandbag bunkers. We often flew in with the hot chow, so we would serve the food. We’d then offer our “game of the week” (home-made, audience participation games). Our “field bags” contained gifts of stationery, card decks, candles, candy, pens, paperbacks, packets of Kool Aid, and small palm-sized mirrors. Back on the bases where we lived, curfew was 12:00 midnight, except at Camp Enari where the military changed it to 11:00 p.m. For the units with Recreation Center activities, one worked the assigned shift for being there at the Center, interacting with the men who came in — playing ping pong, cards, talking. The Centers also staged programs like funny fashion shows or jello eating contests, etc. Often we would work on our “programs” for the road, getting ideas and experimenting (rehearsing) with those who came to the Center. No. I found out 20 years later that a chinook I was on took small arms fire, but I didn’t know at the time. We were headed home after dark but the pilots were called in to extract some troops from a hot area. It turned out the troops were ARVN (South Vietnamese) troops. My Donut Dollie partner was on a headset with the pilots, so she heard about the fire. Not a major injury, but I was bitten by a unit’s pet monkey on a firebase. I asked if it had been inoculated and was told yes. I called everyday on the field phone to ask about the monkey’s behavior (wanting to know if it went rabid), dreading that I might have to take rabies shots. Luckily, nothing dire happened. Not easy. One soldier in a psych ward (strapped down) at Cam Ranh Air pleaded with me to get him out of there. Another time — while assigned to the 4th Infantry, we had a “regular” run to an LZ called St. George. One day, at the end of my tour (November, 1969), we were informed NOT to go to St. George — it had nearly been overrun the night before. We went to see “our” guys who were in the hospital in Pleiku. It was tough, because we had known them as able-bodied and “okay” all those weeks prior to the attack. One guy had had a tracheotomy, but wanted to speak to me. He had to press on his throat. I had to dig my nails into my palm to keep from getting light-headed. I saw that those back home were very busy with their lives, paying little attention to the plight of the American soldiers in Vietnam. Their “concerns” seemed so trivial, for example, “Will we have enough beer for tonight’s pool party?”. Otherwise, a fairly smooth transition — no real problems. That the U.S. military requested this program of the American Red Cross. That we did NOT go to Vietnam to be Call Girls for the officers. That we went because we cared and wanted to help out in some way, with the Red Cross SRAO program offering that opportunity. How do you think the Veterans think of your time serving with them now? Have any Veterans expressed their feelings to you directly? Nowadays they are quite grateful. Many have thanked me individually and we’ve been thanked as a group. Incredible camaraderie within our Red Cross “units” and with the military around us. Chopper rides over beautiful countryside. American boys who really tried to “clean up their act” when we visited, and were very chivalrous. Visiting “CA” (Civilian Affairs) teams assigned to Montagnard villages in the Highlands, receiving great hospitality from the villagers. With my being 6 feet tall and blonde, I think I was quite the novelty to them. Playing volleyball almost every afternoon with the Commanding General of the 4th Division. 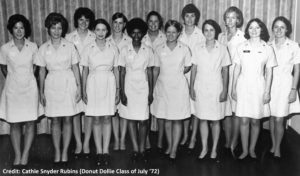 In our thirty fifth edition of the Donut Dollie Detail, Sheila tells how after serving in South Korea, the Red Cross asked her to go to Vietnam to set up new units, that the Donut Dollies were so well taken care of by the troops, and how her experiences changed her life forever. 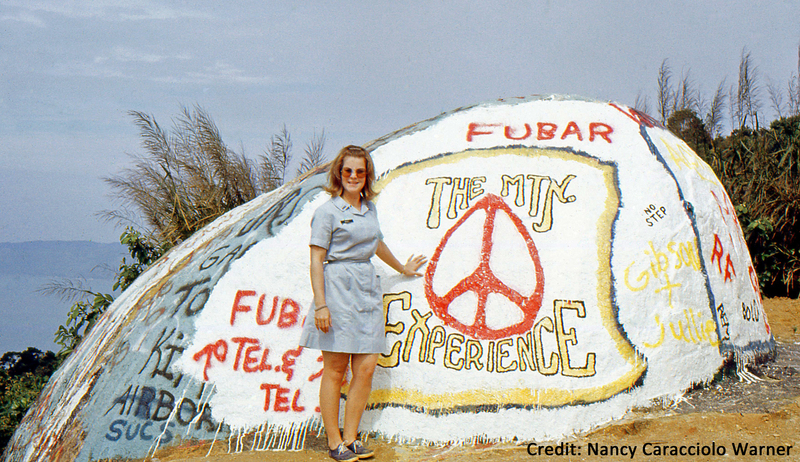 The year before I served in Vietnam, I had been recruited out of college for the SRAO program in South Korea. 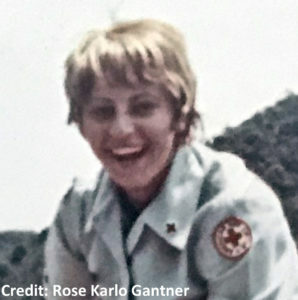 Upon returning home from that tour I signed up to work in American Red Cross (ARC) Hospital Services and was sent to Ft. Sam Houston, Brook Army Medical Center, San Antonio, Texas. I had been there about 6 months when the DC office called and offered me the task of going to Vietnam to set up SRAO units there. The program was getting setup in Vietnam and few units were already were open. It was 1966 and LBJ initiated the big troop buildup, sending 100,000 men that year alone! I was sent TDY (temporary duty) to Long Bin for a couple of weeks until I could go to Phan Rang to set up the unit there. 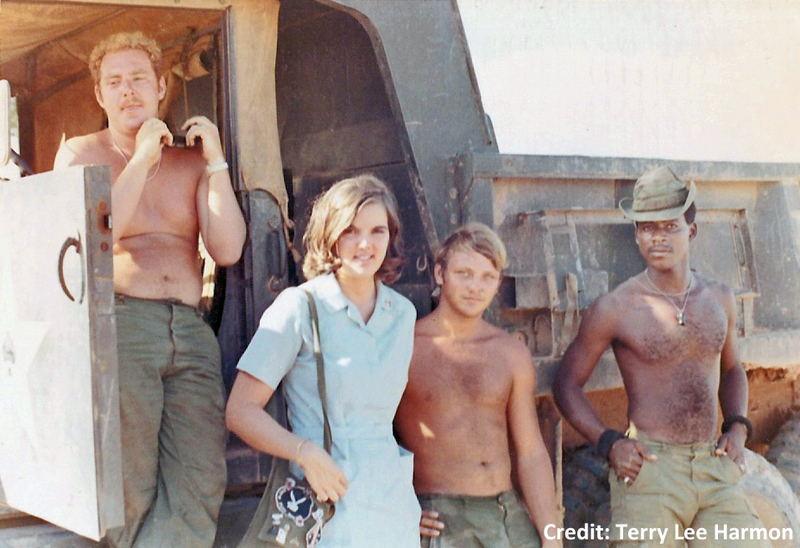 I was at Phan Rang for about 6 months and then sent to Cu Chi to set up that unit until I returned home. 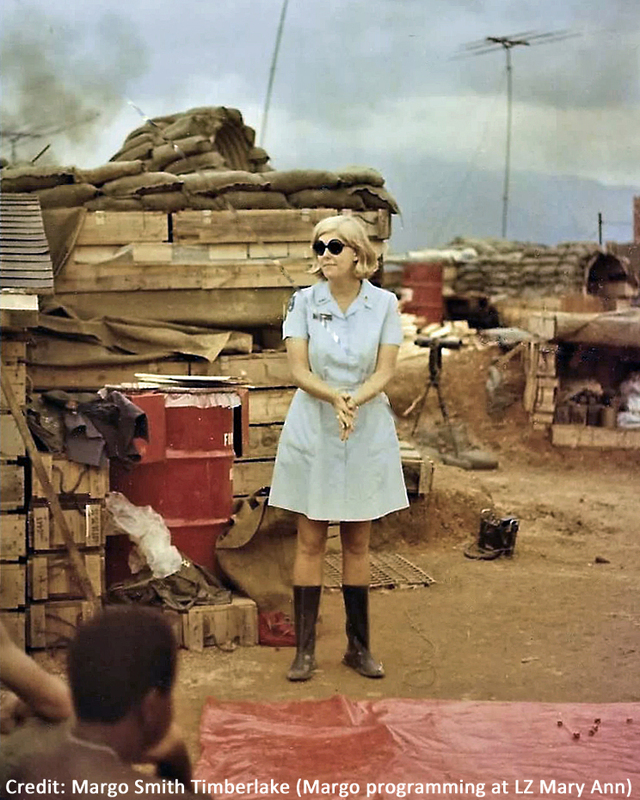 I was known as Sheila in Vietnam. We spent most every day in Hueys traveling out to forward areas to do our programming for troops who were on stand down for few days. 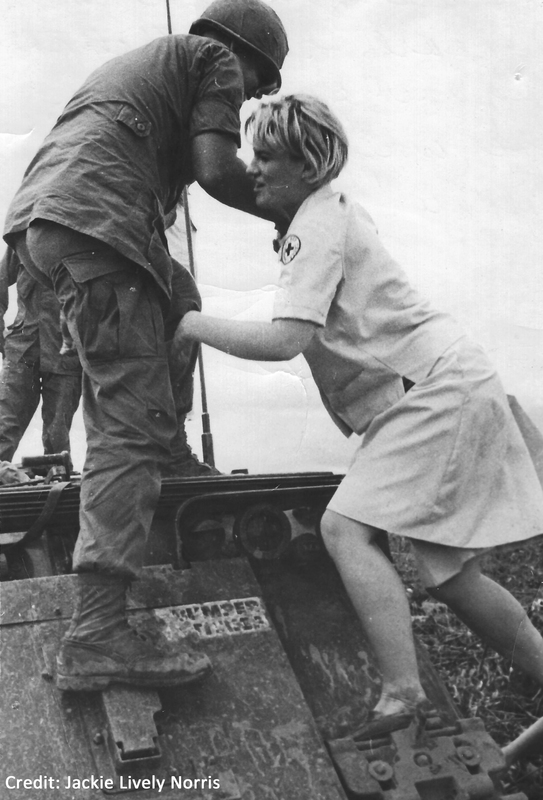 One day a week at Cu Chi we were assigned to go to 121 Evac Hospital to visit with the troops there. Friday was for our staff meeting and for working on upcoming clubmobile programs that we would take out to the troops. 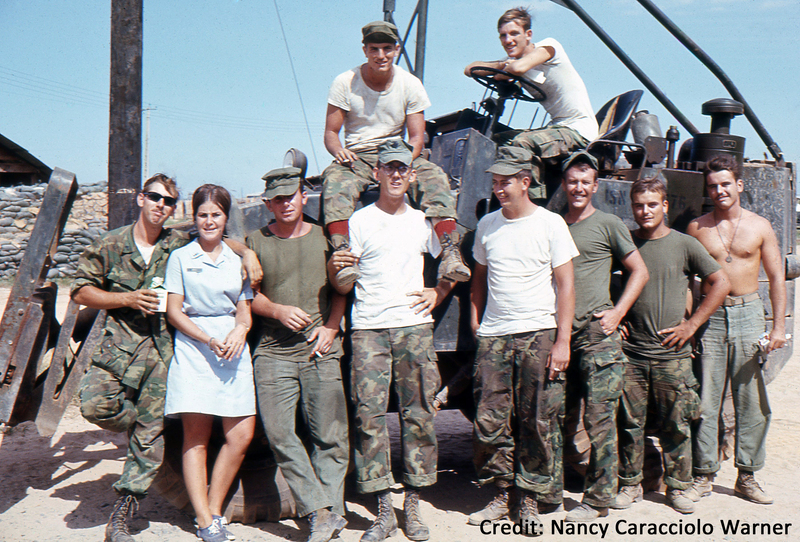 At Phan Rang we opened a recreation center where troops could come any time during the day for cards, games, coffee, etc. – like a canteen. No, I was very lucky. And when I think back about it, it was a very dangerous time there because so many areas were not secured, because it was at the beginning of the conflict and we never knew where the enemy was. There were mostly expeditionary forces when I got there. When I was TDY at Long Bin for that two weeks, we were mortared every night! My introduction to Vietnam. 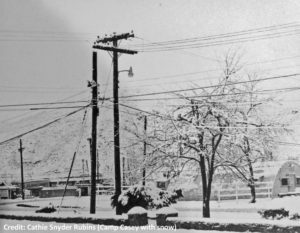 It was in the distance from our hooch and headquarters, but I can still remember the noise and the sky lighting up, especially when you had to go to the outdoor privy and you really don’t want to just then. Same thing at Cu Chi sometimes. We didn’t know it at the time, but that was such a strange place. We had mamasans who were carrying grenades, etc. coming in. They got rid of them of course. It was tumultuous there the whole time and the reason being is we found out later we were living over the infamous underground tunnel system that the VC had built. There were a few times when we were at Tuy Hoa for the day (it was just a staging area or forward area base at that time and we had to be out of there before dusk) and our pick up transportation did not arrive. The CO was really nervous, but they always got us out. No, I was not. We were always so protected and well taken care of by the military. I have never been treated better by men in my life than there! Love them for that alone!! Of course it was tough. We saw just about everything you can see. But we generally saw them after they were patched up and healing. I really saw much worse when I worked at BAMC (Ft. Sam Houston) before going to Vietnam. There I worked the burn and trauma ward. 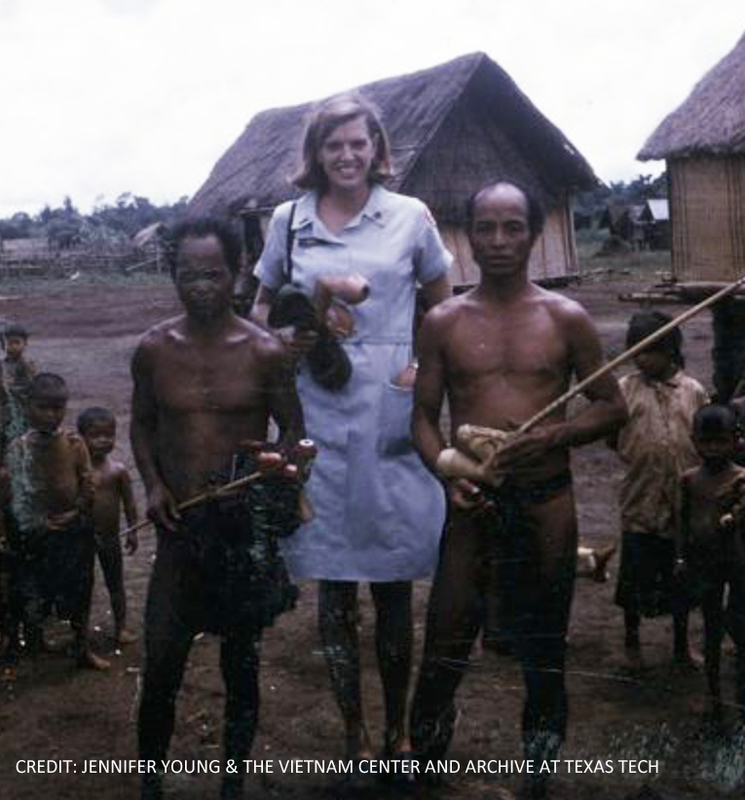 These were the worst of the worst who were medevaced home as soon as possible from Vietnam. They were napalm burned. Nothing worse than fire on the human body. I still have images of a few of the men. I wished for them to die. It had to be better. I hibernated at my parents home for about 6 months. I was happy to sit there and do nothing. I saw a few friends who came to visit me there. Then I went looking for a new job, as I had gotten out of ARC after Vietnam! I was fine. I went on to grad school and marriage, children, and the usual lives we lead. We were not your average American girl, but girls who were part of a new generation of women who wanted adventure, more freedom, recognition, and authority! Those experiences changed me forever. I am a much better woman, mother and citizen because of them. When I first came home, none of us who had been there admitted to being there because America was not friendly to returning vets. Awful for them! But we would have been submitted to the disdain as well, but no one expected women to have served there – especially in our capacity. So I didn’t share it with many people. But through the years as all that changed, the vets loved us and are so grateful for us being there. They know we we were volunteers – like some of them were, but most were drafted. I love them dearly and we have a special bond. The men and what they went through and what they sacrificed for a civil war that we had no business being a part of!! That’s all I can think of, really. I am forever a Pacifist. War is not ever the answer!! 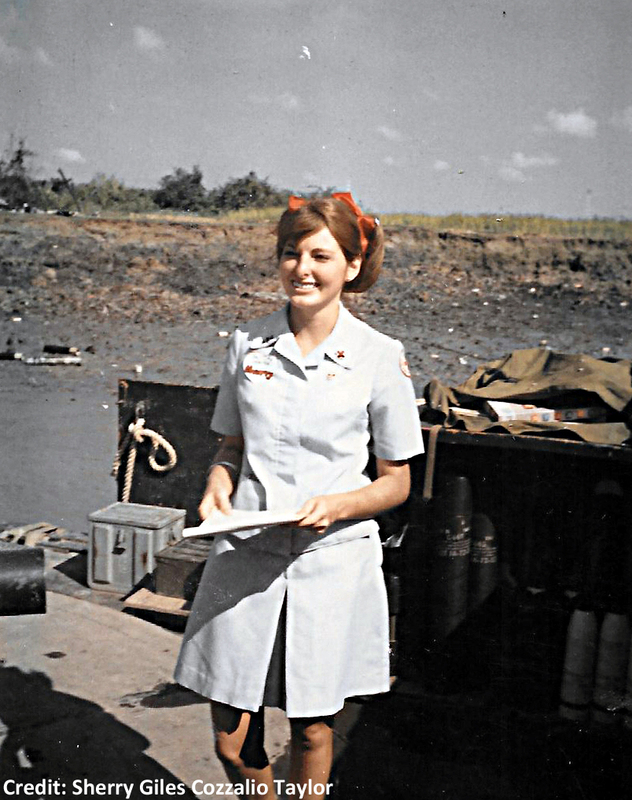 In our thirty fourth edition of the Donut Dollie Detail, Rose tells how both President Kennedy and her maternal uncle influenced her decision to go to Vietnam, how she was one of just a few women who served in the Vietnam SRAO program twice, and how the experience was life changing. In my era, while in college, President John Kennedy really moved me with his famous quote: “My fellow Americans ask not what you country can do for you, ask what you can do for your country.” After being a teacher for a short time, I decided it was my duty and honor to give back more and knew in my heart and soul it was going to be Vietnam or the Peace Corps. A special influence in my life was my wonderful and brave maternal uncle, M/Sgt. George Mamula, who served in WWII and the Korean war. 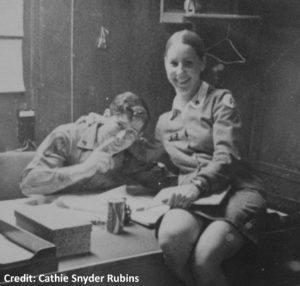 He had distinguished himself quite early as a soldier, and was assigned to Merrill’s Marauders in WWII. During WWII, he was awarded the Distinguished Service Cross, second only to the Congressional Medal of Honor, for his bravery and outstanding leadership in Kumhwa, Korea, on September 9, 1951. He was committed to his country, his Army and all his troops. I and others in my family, especially express much gratitude to him and others who gave so much to protect our freedom and liberty. I will forever cherish the marvelous stories he told me as he made history come alive. 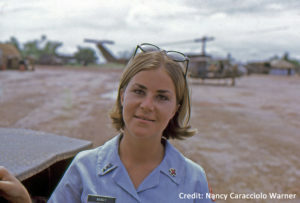 I believe I was one of only four American women to serve in the SRAO twice. 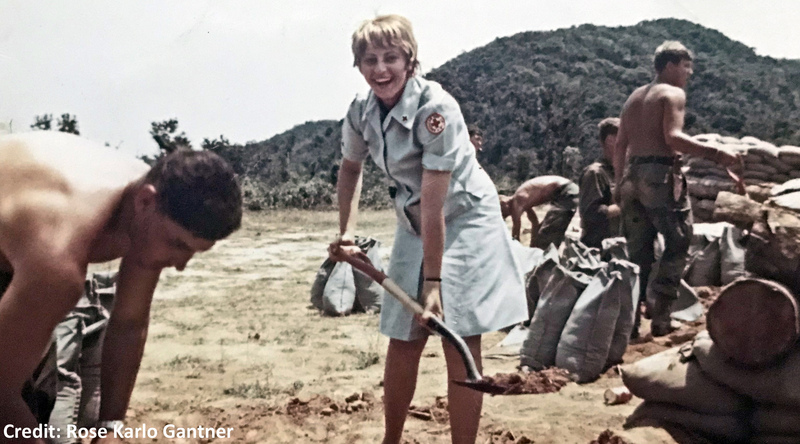 During my first tour of duty from June 1966 – June 1967, I was first assigned to Nha Trang before being promoted by my wonderful supervisor, Liz Miller Magnum and transferred as a unit director to Pleiku. Along with others, we mainly served the U.S. Army troops, but also had an Australian troop in the HIghlands where we gave support and morale. My second tour, in January 1969 – January 1970, I was asked by the headquarters of the American Red Cross, SRAO program and Quinn Smith, who was like our executive president, to return to Vietnam as the Senior Program Director to the 100 or so women who were stationed throughout Vietnam at the time. I was stationed in Saigon, but only lived in the area one day a week as I traveled constantly to our 13 units deployed throughout Vietnam to offer leadership, guidance, support, and work with military leaders regarding logistics and safety concerns. I was known as Rose during my time in Vietnam. 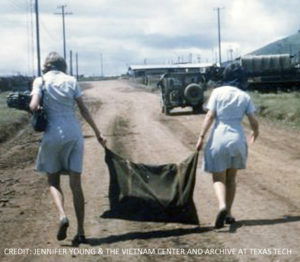 Typically two young ladies (usually one from the North and another from the South or different regions) would travel as a team to the forward fire bases via helicopters, jeeps, and tanks. Throughout the day their goal was to offer “a one hour break and morale builder” to our troops through recreational games and activities. No day was ever routine, as we learned resiliency very early on. 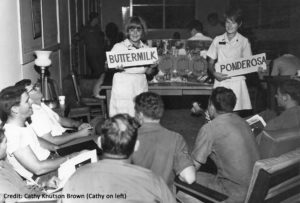 We were affectionately called the “Donut Dollies.” Refreshments were served during these times to allow the troops to relax and think about their loved ones. We were blessed that some of the ARC girls (American Red Cross) had other training and experiences in Korea prior to Vietnam. My supervisor did, and this sure helped to facilitate daily matters and to make good decisions. If something happened in the forward firebase that was either unfortunate such as a recent attack, or sad days due to loss of so many brave men, we could modify our programs and try along with others, to offer comfort, hope and gratitude. One great experience was jumping in the dirty pool of water with troops and having tons of laughter and feisty play. I even got to learn how to shave a young soldier’s face! After being in the field for 10 hours daily, after getting back to our base camp, we went to visit the wounded in the hospitals and to aid the nurses and doctors. I loved the medical team who so bravely served our troops and tried to repair their wounds and injuries, while we tried to repair their hearts and spirit. I was one of the very few girls who requested to see the troops who had depression and other mental health problems as these men were “forgotten” or perceived as not brave at the time. Now, we know they suffered from post traumatic stress disorder. This experience, especially helped me to learn my passion and purpose in life. Another great experience was going out in the field and visiting the Montagnard villages and helping with hygiene. 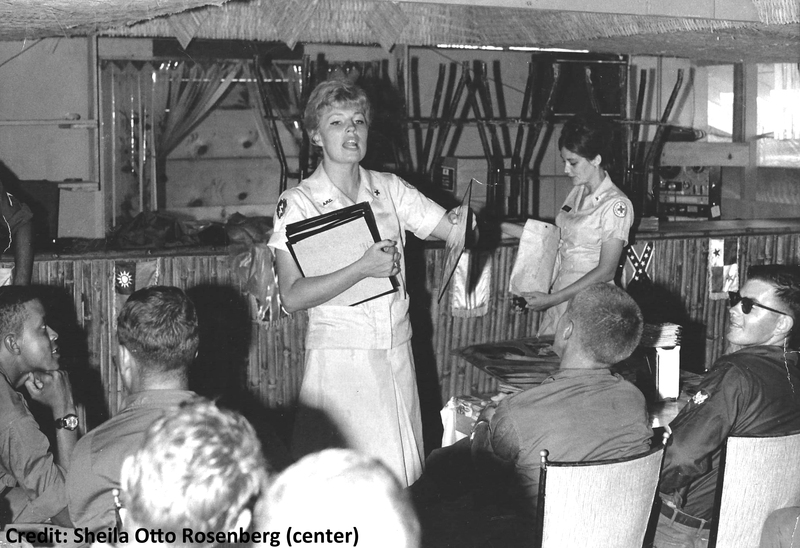 We were led by Colonel Martha Raye, who also stayed with us for several days while touring Vietnam. 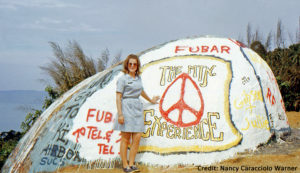 While I was supervising others during my second tour, along with about three other senior leaders, we had the “big picture” and had to decide what young leaders should be placed in what units and why, who should be promoted (now called talent management), and tried to match their skill sets (writing, history, drama, teaching etc) with their personalities. When you have many young leaders sharing the same mission and passion, but small physical space with some rough conditions, it behooves one to think carefully of the personnel and placement (HR functions). It was a joy to have the opportunity to work with high level military personnel as well regarding program selections, logistics and more. Yes, as I traveled during my second tour throughout South Vietnam, I flew in many helicopters to get to many places in one day or more. Occasionally, the close calls were more for an equipment or maintenance failure. I knew if something terrible happened, I was going to be with the very best in God’s hands. I trusted the soldiers completely, as they were so professional and genuinely cared about our safety too. Initially I was scared to death, probably threw up when I first experienced some horrific scenes of soldier’s injuries and battle wounds, but got over it quickly, and then, responded, “What can I do to help?” “What can I do to make it better?” Many times it was just holding someone’s hand and letting them know you cared. Living with nurses during my second tour really helped a lot and I am forever grateful for what they taught me. Difficult initially as everyone had such mixed feelings about the war and at what cost to lives, besides financial and geopolitical matters. I remember playing a lot of music to heal my soul and adjust to normal life again. I jumped right back to full employment, which certainly helped and started to focus more on the positives than to think about the negatives. We were idealistic young, college graduate leaders who wanted to change the world and do a social good. Because of the SRAO, we were given this privilege and honor to serve our country with pride. 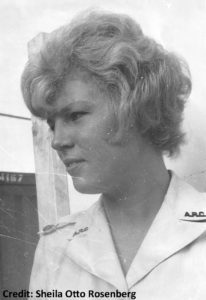 Many young women came from military families or had someone in their family who influenced them to take this step forward. This experience forever changed me and made me a more tolerant, kind, and compassionate person who always wants to continue to make a difference. I know my “sisters” from the ARC all feel this similar or same desire with passion and purpose. This is why I later became a counseling psychologist and consultant nationwide, and personally provided pro bono treatment to soldiers and their families with PTSD for over ten years while having my Center for Life Coping Skills, in Columbus, Georgia. I only wish that when the good Lord takes me to his heavenly home, I along with all other women who served in Vietnam (even though we were civilians and have no benefits), we could be honored with the American flag on our coffins too. Perhaps this is something that should be suggested to our political leaders today? Having the opportunity to serve and help shape other young talented ladies who shown a lot of humility and purpose, and who always would go the extra mile to accomplish our mission. Making long term friendships with ARC girls and some vets that was built on integrity, trust, and solid character. Having Colonel Farmer, from the Army in Pleiku, track down my first cousin, Jules Bobik, a brave enlisted soldier serving in the southern portion, for me, and coordinating with others to have us visit together for a few days in Vietnam. Awesome! Tears and joy forever! He is now in Heaven, but I know Jules is looking down and smiling from above. Meeting my former husband, Charles J. Gantner, Jr, who was an Army Captain and aide during my second tour. After 12 years of marriage, we divorced, but have fond memories of our experiences together. I am delighted he has since remarried. Having the opportunity to do the SRAO service twice and to continue to learn, grow from mistakes, and become the person I am today who is very contented, healthy, and enjoys a great quality of life. I’m always ready and willing to continue serving in other new capacities as a recent retired person. In our thirty third edition of the Donut Dollie Detail, Terry tells how her mother inspired her to go to Vietnam, how she still looks up when she hears a helicopter, and that she has fond memories of visiting China Beach and an orphanage in Danang. There were several equally compelling reasons that I volunteered to serve with the Red Cross in Vietnam. I suppose first was the inspiration of my mother, a Woman Air Force Service Pilot in WWII. Vietnam was on our minds. My friends were being drafted. When I graduated from college I was already aware of three friends/schoolmates who had died serving in Vietnam. My mother had found a way to serve her country during war, and I was looking for a way to serve mine. I also certainly was inspired by John F. Kennedy’s powerful words in his January 20, 1961 Inaugural Address “…ask not what your country can do for you, ask what you can do for your country.” It was patriotism. There were protests, and the press reporting was conflicting and incomplete. I wanted to understand the war and the sacrifices. I was looking for a way to be engaged. I was looking at options of joining the military, but positions for women in Vietnam were limited. Then I read an article about the SRAO program in my sorority magazine. I contacted the Red Cross, applied, and was accepted. My first base was Cam Ranh Airbase (March 1970 – August 1970) and my second base was Danang (August 1970 –August 1971). I was known as Terry in Vietnam. I don’t really remember anything being routine. I remember being very focused on what we were there to do… bring a bit of diversion or per the title of the Arrowhead documentary on us, “A Touch of Home”. Generally where I was assigned, we worked one day a week in our recreation center and flew out to firebases the other days. I know we had some time off, but I don’t remember it being one day a week. Often time off and evenings were used to work on the next program. The day we worked in the center we played cards, pool, foosball and just chatted with the soldiers, airman, marines, and sailors who came in. I never did pick up pinochle which was most popular, so I usually sat and watched and chatted with the guys when they were playing cards. We also worked on our game-based programs that we took out to the field. We also spent a good part of any time off we had working on our programs and upcoming events for the recreation centers. I loved the days we traveled the most. The military took care of us. We always traveled by chopper. To this day the whop whop whop of a Huey makes me look up and recall Vietnam. There was nothing like the response you got from the guys when you started out a program… “Hi, I am Terry from Silver Spring, Maryland. Anyone else out there from Silver Spring?” We just fell in love with the American GIs. Most were probably there due to the draft. Conditions on the firebases were rough. America was in turmoil at home with protests. They always treated us well and were glad to see us. No. Once I was on a firebase and they were shooting at the VC. Any incoming was not making it to the base. No one took cover and some of the servicemen were taking photos. During both of my assignments I was housed on bases with or near airfields. Maybe we were too complacent, but at night we got used to sleeping through the sound of incoming rockets. The target was the airfields and the rockets seemed to reliably land in the vicinity. No. While I was in Vietnam we lost two Donut Dollies. One was lost to what we were initially told was a respiratory problem, and which I believe ended up being Guillain-Barre Syndrome. I remember getting updates, it seemed like over the course of two weeks. We were told she was too ill to transport home, and then we were told she had passed away. I did not know her. 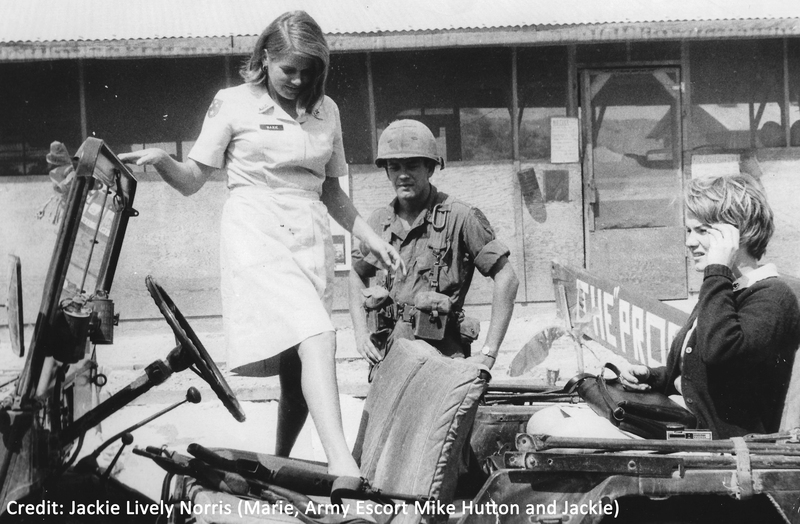 One of my most poignant memories of Vietnam was visiting a solider from Texas in the hospital who had lost both legs. He made it easy to visit him. He was so proud to be a Texan and to be serving his country. He had a huge Texas flag draped on the wall behind his bed. I often think about him and hope his country did not disappoint him when he arrived home. Other than that one particular incident I just remember helping the men write letters home. 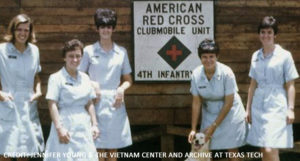 When I returned home, I volunteered for the Red Cross at Walter Reed Hospital. 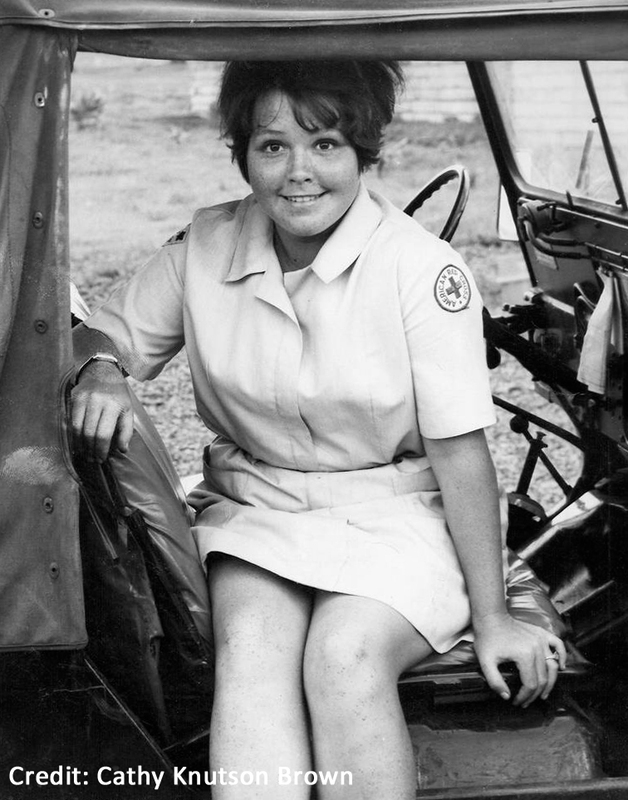 When the wounded came off the ambulance, I rolled their gurney to a pay phone and placed their first call home for them courtesy of the Red Cross. This was in 1971 prior to cell phones. My return home was pretty routine. I came back through Travis Air Force Base. I remembered I was looking forward to getting a hamburger and fries at McDonald’s. I returned to Maryland. As with the GIs, I really didn’t talk about the experience. I also don’t recall anyone asking much about it. I think people could not relate to where you had been or what you had done. The GIs loved the Donut Dollies and we loved them. 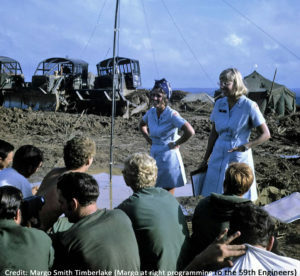 We were patriotic, fun loving and were looking for a way to support our servicemen (and it was only men where we served, though at some locations we shared barracks with the nurses) regardless of the political climate. I mentioned my mother was a Women Air Force Service Pilot in WWII. I traveled to a lot of events with her over the years and would occasionally meet a Vietnam veteran. If I bring up that I was a Donut Dollie they always thank me. I think there is a feeling that we were in it together. The Vietnam GIs feel a common bond with us, and they appreciated that we volunteered to serve in Vietnam and bring that touch of home to them. I remember thinking how peaceful the country seemed in the evenings, and yet I was in a war zone. 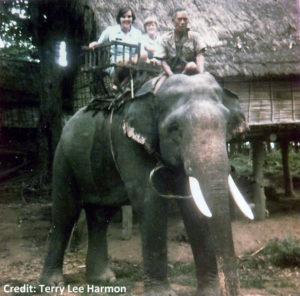 I have a fond memory of getting off the plane at Tan Son Nhut Air Base in Saigon worried about what I was going to encounter. I looked across the tarmac and saw a group of GIs playing volleyball. This one tall blonde head stood out, and I thought that looks like Bill, one of my high school classmates. Sure enough it was. Just incredible. We still talk about it to this day at high school reunions. I remember China Beach with fondness. Sunning on the beach and enjoying lunch on the patio of the China Beach Club. I had the opportunity to return to Vietnam a couple of years ago. I could not recognize anything. All that was left out there were the shelters that our planes used to park in at MAG16. Of course, Marble Mountain was still there. I was thrilled to walk up the mountain and see all the tunnels, etc. where the VC supposedly hid out. I also visited the Cu Chi tunnels outside of Saigon on this trip and could not believe what it was like down in those tunnels. Back to Marble Mountain, I am reminded of the time while escorted I went to a small village near Marble Mountain and a woman wanted to sell me her baby. When I returned to Vietnam I also went to Hanoi. The contrast to this day between what was North and South Vietnam is striking. Though I had planned to visit Hoa Lo Prison (Hanoi Hilton) once I got there, I chose not to. We didn’t really get much in the way of security briefings. When I travel overseas today, I always remember how I was surrounded by a group of young children on the streets of Saigon and had my pocket picked. They only got $20 so I was lucky. I was on my way out of country to R&R in Australia and had wisely left most of my money back at the office. The Texas veteran I mentioned previously is a fond memory of the spirit and of our GIs and the pride they take in their service. I like to think about the work we did in Danang with an orphanage, and how creative the children were at making up games with anything that was available. In most cases the Vietnamese people were very nice. I do remember visiting a market in Danang and several older women spitting at me. The men who worked in our recreation centers were very helpful and creative, as well with ways of improvising when tools were not available. I always liked working with the Green Berets in Ban Me Thout. One time they took us to a Cambodian Refugee camp. Another time they took me and Penni (we always traveled in pairs) to visit a Montagnard home and the owner took us for a ride on his elephant. There were disturbing stories related to us sometimes when we talked with the men who came to the recreation center. Most disturbing were the stories of an airman who would tell me about taking up prisoners to be interrogated in a plane, holding a pistol to the prisoner’s head while they interrogated and threatening him with being pushed out of the plane, and in some cases actually pushing them out of the back of the plane. Never having thought about or being exposed to anything like this, I still to this day don’t know what to make of it. I could see this taking its toll on the airman, and this would probably fall under some degree of PTSD for him today. Given the airman’s intensity in relating this to me day after day, I believe there was truth to his story. There were also the servicemen who kept re-upping (serving multiple tours) and couldn’t seem to go home because their reality had changed so. I suppose I should also relate some memorable experiences with the marine helicopter pilot I ended up marrying, but later divorcing. I met him at a party at MAG 16. He had been pulled back to fly a general after nine months of action, which eventually earned him two DFCs and a silver star. As a pilot for the general, he had a helicopter assigned to him so he was able to fly across the street from MAG 16 to the Navy barracks where I lived. We would go to the officers club and have dinner and dance and hang out and then he would fly back across the street. One evening he asked me if I wanted to go for a ride. So I got in the helicopter and we flew around the area and saw Danang from the air at night. I think he pushed his luck when he buzzed the MAG16 airfield. After he dropped me off, and flew back to MAG 16, they were waiting for him. He ended up getting a reprimand and being assigned to work with the MPs the last couple months of his tour. One night while we were talking on the phone, there was an explosion and I heard scrambling and then the phone went dead. I did not know what had happened. The next day he called me from the hospital and explained that a marine on drugs had thrown a grenade into the office where he had been sitting with several others. He had shrapnel wounds, but would be ok. They ended up medevacing him out of the country. The marine who threw the grenade ended up in prison back in the US. In our thirty second edition of the Donut Dollie Detail, Sherry tells how growing up in a military family informed her decision to go to Vietnam to support our soldiers, how she had a couple close calls, including a mortar landing in the middle of a stand down party she was attending, and how the Donut Dollies were at the forefront of the women’s movement and that she believes they made a difference for the men who served. I grew up in a military family. I understood the sacrifice a man makes when he chooses to serve and safeguard his country. Many of the boys I went to high school with were drafted and went to fight a war we didn’t understand and were too young to know what we supported. 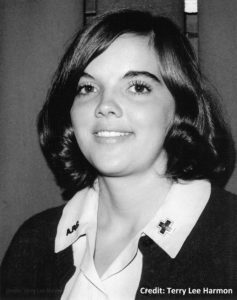 In 1968, I was a senior attending Oklahoma State University. Three months before graduation, I had a teaching job lined up and was planning a move to Evergreen, Colorado the following August. During the late 60’s there were few opportunities for women to serve their country, so when, I read an article about college graduates working for the Red Cross in Vietnam, I knew I had found a rare opportunity to serve my country. During a time of anti-war protests, I was going to show our young soldiers I cared about them and supported them. I applied to the American Red Cross for a position with Supplemental Recreational Activities Overseas. I received a letter back with an airline ticket to St. Louis, MO., to interview for the position. During the interview I was told only people who volunteer for Vietnam were sent there. I volunteered. A few weeks before graduation I received word I had been hired and was scheduled to attend the June class in Charlottesville, VA. In training, I learned to hem my blue dress no shorter than knee length and to style my hair so it didn’t touch my collar. We studied the history of the Red Cross, military rank and protocol, and learned how to develop a program. Six weeks after my college graduation, I stepped off a plane at Tan Son Nhut Air Base to a blast of heat and unusual smells. I never made it to Colorado and have never regretted it. I was first stationed at Long Binh (II Field Force) from June – October, 1968, then TDY (temporary duty) at Phan Rang Air Base in October, 1968, followed by Bien Hoa from November, 1968 – January, 1969 and finally Dong Tam from January – June, 1969. I was known as Sherry in Vietnam. Each unit was different. Long Binh had 12 girls while Bien Hoa had five. We would go out in pairs. We were usually scheduled with a different Donut Dollie each day. A new girl was always scheduled with a seasoned girl, who taught her what to do and introduced her to the guys in the units. The Long Binh (II Field Force) Unit had a Recreation Center. We usually had one day each week scheduled in the Recreation Center. We also used this time to develop our programs and perform our assigned unit duties (mine was secretary – I typed the notes taken during our weekly staff meetings). In pairs, we also traveled by jeep to many Long Binh units such as, logistics support, motor pools, signal units, etc. 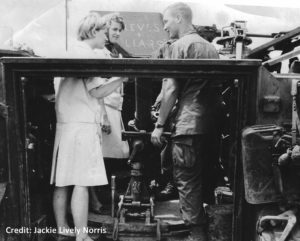 We went by jeep to Saigon to visit combat troops positioned in Cho Lon and at the Y-bridge; traveled by jeep to an Australian unit at Nui Dat; flew by helicopter to a signal unit on Hill 831, Nui Ba Din and flew to Ka Tum. We also supported Bien Hoa Air Base. When we were on the road visiting combat troops, we were up early to program at several different units. We ate C-rations for lunch that the troops shared with us, while sitting on sandbags or under whatever shade we could find. We arrived home in time for a meal in the II Field Force Officer’s mess. Our home had a 12’ fence surrounding our long two-story barracks. We showered in an open bay with six showerheads – no hot water. Our rooms were small, with a cot and screened opening for air circulation. The Phan Rang Air Base unit was a treat. The Air Force had given this unit of Donut Dollies their own pink jeep and provided them with a well furnished air-conditioned “home” with hot water. Each bedroom had a nice twin size bed and mattress. I worked in the Recreation Center the two weeks I was there. The Bien Hoa Unit also took over support of Bien Hoa Air Base. We didn’t have a Recreation Center. We had a workroom in our hooch, where we developed our programs and performed our assigned administrative tasks (mine was keeping the supply room stocked). A typical day could include: programing to various units of airmen stationed at the air base. We also worked on the open bed of a truck serving Kool-Aid and chatting with airmen working in hangars near the runway. Other days we programed to groups of guys at support and logistics units on the Bien Hoa Army side of Bien Hoa. We might be scheduled to fly by helicopter out to units that belonged to the 101 Airborne Division. We would be dropped off for a couple of hours to program and talk to guys and then picked up and flown to the next unit. We would visit 3 units and we always made it home by nightfall. The reason Donut Dollies traveled in pairs was a safeguard if they ever got stuck overnight in a remote unit. It never happened during my year there. The Dong Tam Unit supported the 9th Infantry Division. There was no SRAO Recreation Center there. 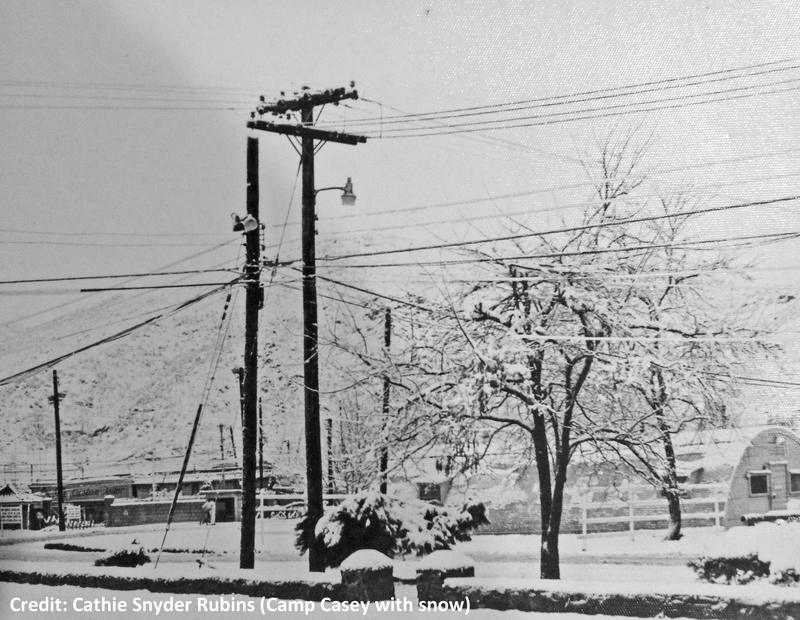 Our primary role was to fly by helicopter to forward base camps where combat units lived. Our days began at dawn. We would be picked up by a driver and driven to the airfield. Our schedule would include two or three stops, where we would spend 2+ hours before being pickup and flown to the next unit. Once we were dropped off at a base camp we would stop in at the operations center to get our schedule. A soldier would be assigned to take us to a group of guys waiting for the Donut Dollies. We would play games or just talk to a group of tired guys who had spent the night patrolling the boonies. On days I was scheduled with Emily, she usually brought her guitar along. The guys loved to sing along with us. We often spent time talking and kidding with a platoon preparing to go out. We ate C-Rations for lunch and drank hot Cokes. We often returned to Dong Tam after mess hall hours, so we “dined” on LRP Rations, which were an epicurean delight after our C-Ration lunch. Tara, one of the Donut Dollies in our unit had connections with a long-range reconnaissance patrol captain, who provided us with all the LRP Rations we could eat. On Sundays, we always dressed up and had dinner with the Division generals and senior officers. When we were scheduled a day in our Unit, we worked on our programs. We might also be scheduled to visit the 9th Infantry Battalion Medical Hospital wards. Or, we programed to guys working in support units in Dong Tam. We usually served Kool-Aid to guys working in the headquarters area. We also visited Mobile Riverine Force troops and Navy sailors living on ships anchored in the Mekong River, just off Dong Tam. We visited and programed on small watercraft with a small number of men as well. When we didn’t go by helicopter to the ships, we had to be carried from the bank of the river to a small boat, in the arms of one of the men. There were lots of volunteers for that job. Visiting the ships was always a treat because we would eat in the air-conditioned officers dining room, with white tablecloths, “real” dishes and silverware and no flies. In Dong Tam, “incoming” mortar attacks occurred more often than not. We spent a lot of time in our bunker. One evening a round exploded just outside our 12’ wooden fence that threw shrapnel all over our metal roof. Probably the closest call I had was while attending a stand down party. Periodically units would come in from the field and we usually had invitations to attend stand down parties. Steaks and beer were served and we would each sit with a group, talk about home and share funny stories. After we had eaten, I was standing with a group of guys when a mortar round landed in the middle of the party. Shrapnel hit almost everyone except the three donut dollies attending the party. The circle of men around me protected me. I know at least one man died. I wasn’t injured, however, I did spend two weeks in the Long Binh Hospital with dysentery. I had been in country a couple of months and was visiting with a group of soldiers under the Y-bridge in Saigon. A Vietnamese lady offered me a Coke, which I happily accepted. I was hot, tired and very thirsty. After a few sips, one of the guys I was talking to grabbed the Coke from my hand and threw that wonderful cold drink away. He said, “Never accept any drink with ice in it. The ice is made with river water. 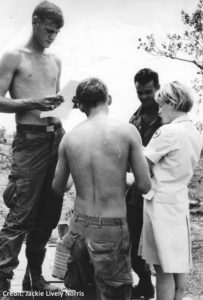 About a week later, I woke up with a very high fever and was sent by the medic who ran our little clinic, located at II Field Forces headquarters, to the hospital at Long Binh. I was packed in ice for a couple of days. The worst part of the experience was being in a huge ward with a lot of guys on bunk beds in long rows. Since they didn’t have facilities for women, one of the medics set up a little “potty room” for me, made out of sheets hung over a frame. It was at the far end of the ward tucked among a row of occupied bunk beds. I think you get the picture of me walking down a long passage way in my hospital gown pulling my IV pole. I’m sure you can all imagine me trying not to make the noises that come along with dysentery – not to mention the smell. Then I had to walk all the way back to my bed with many eyes following as I passed by. We were never scheduled to visit severely injured solders. We did visit wounded soldiers, many who we knew and recognized from our visits to the forward base camps. Although their injuries were serious, we knew they were going to survive and in many cases were going to be sent home. We were happy for them. 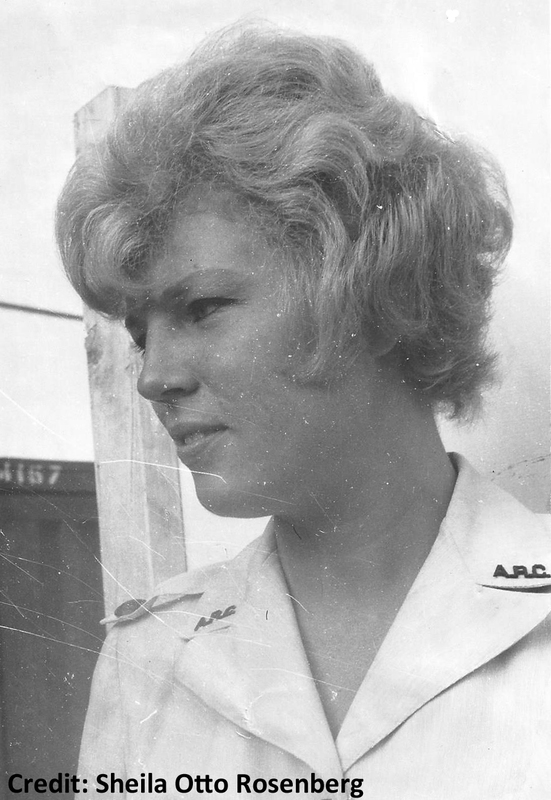 When I left Vietnam, I took a delay in route home through Hong Kong, where I met Marge Fisher, a Donut Dollie who was on R&R from Dong Tam. Then I headed to Travis AFB. I took a bus to San Francisco where I connected with a flight to Little Rock, AK, via Love Field in Dallas. My flight into Dallas was the last flight of the day. For a year, people had surrounded me and now I found myself completely alone in a big room, waiting for my flight the next morning. I hated feeling so disconnected. I was glad I had a job to look forward to and hoped it would give me the sense of purpose I was leaving behind. I spent three weeks visiting my parents, and then drove to New York City and my new job. The first few years home, I couldn’t see a war movie without a strong physical reaction. I couldn’t separate the story on screen from the reality of war. I never spoke of my time in Vietnam. I knew serving there was not an acceptable choice and most people didn’t want to hear the word Vietnam. I finally began to speak of my experiences there when I went to the Wall in Washington D.C. for Veteran’s Day, 1994. I met Emily Strange, who also served in Dong Tam. As Emily and I walked along the Wall, I began to cry. It was several years before I could visit the Wall and walk along it without crying. I was personally connected to the names on that wall in a profound way. I knew way too many of the people on the 1968 – 1969 panels. We were pretty radical. We went to war – a very unpopular war – to support our country and the guys who answered the call to serve. We were young, independent women who were at the forefront of the women’s movement. We made a difference. The first year I went to the Wall, I met a vet who put his arms around me and gave me a big hug. He said, “I just want to thank you girls for your service. You have no idea how much you meant to us. When I was wounded, I know the nurses saved my life, but you girls saved my soul.” That was the first time I realized my time in Vietnam made a difference. I go as often as I can to the 5th/60th Battalion, 9th Infantry Division Reunions. Those guys make me feel pretty special. I never get tired of hearing, “You girls meant so much to us.” I always reunited with Emily and Marge at the reunions, but this past year Emily passed away and Marge couldn’t make it. When I said I was going anyway, my husband expressed concern because I would be alone. I smiled and said, “I will never be alone among these guys, they are my brothers and they always take care of me. 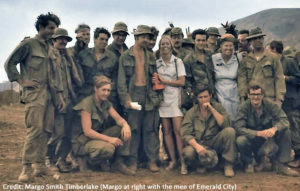 I remember some of these men from when Marge, Emily and I were in Vietnam playing games with them, and bringing a little touch of home to their days. This past June, a young vet who had served several tours in Iraq and Afghanistan, was attending the reunion with his Dad. He told me he wanted to give me a big hug for my service in Vietnam. He told me, “You have no idea how much you mean to my Dad.” The vets see us as vets too. They often express how upset they are that we are forgotten. 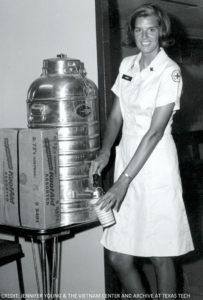 Agent orange affected the health of several Donut Dollies and their children too. I understand their frustration, but I also realize I volunteered for them because they did what was right when they were called to war. 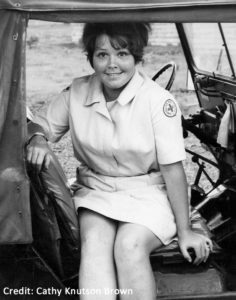 I think it is shameful the American Red Cross doesn’t celebrate the amazing women who served in wars along side our soldiers. Boys and their toys – they loved taking us on rides on top of their APCs, or teaching us to drive them (I went on patrol sitting on top of an APC one afternoon while visiting a forward base camp.). They wanted to show us how to shoot their M-16s. A C-130 co-pilot invited me up to the cockpit because the pilot wanted to visit with me and show me how to fly (I thought the poor guys in that plane must have been a little nervous with me flying.). I rode on all kinds of boats, the airboat being most memorable. A Cobra pilot took me for a ride one night from Dong Tam to Tan An Airfield, and back to show how smoothly he could land in the dark (The guys in the tower were surprised to hear my voice calling final as we approached the airfield.). I will never forget the drive through Saigon, from II Field Force to Cho Lon. The once beautiful city was bustling with huge OD green trucks stirring up dust. Small motorcycles built for two had whole families sitting on the backs, weaving in and out of all the traffic. Small horses pulled carts of goods and produce through all the chaos. The drive through the market area was filled with exotic foods, silks, spices, fruits, and fish so strong I had to put a cloth to my nose to breathe. Women would squat by the curbside to pee. How beautiful and graceful the women were wearing their black and white ao dais, the traditional Vietnamese dress. Then we would enter into the Chinese section, Cho Lon, to see our guys living among gray concrete ruins of buildings destroyed during the Tet Offensive. On one visit, the guys had found a birdcage in the ruins and placed an empty can of Falstaff beer on the perch inside the cage. They loved showing us their pet bird Falstaff. 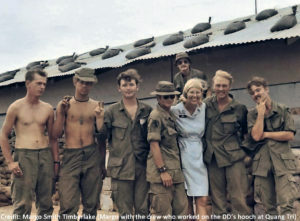 One of my saddest memories was of a flight from Dong Tam to Tiger’s Lair, a forward base camp, where most of the guys had been engaged in large battle all night. We sat on the edge of the airstrip, waiting for body bags with soldier’s boots sticking out, to be unloaded before we could get on. That day we shared a ride back to Dong Tam with the bodies of soldiers who were killed during the time we were visiting. Those were the days we didn’t program; we would just be there to talk about home. We started the day by serving a hot breakfast to tired soldiers being brought in after a night of fighting. They always had a smile for us when they lifted their heads to see who belonged to the unexpected soft voice asking if they wanted eggs and bacon? The strangest experience we had was sharing a ride home from Tiger’s Lair, with a Viet Cong POW sitting on the helicopter floor at our feet. On several occasions, we would be serving Kool-Aid in the 9th Infantry Division headquarters area when an enlisted guy would come running out of the headquarters building as we were leaving. He would tell us the Chief of Staff was in one of his very bad moods and we always cheered him up when we stopped by with a cup of Kool-Aid. We never served the officers, but we always went to the Chief of Staff’s office when we got this request. He would always have a smile on his face when we left and the day would go smoother for everyone in his office. One afternoon we were visiting with a platoon getting ready to go on patrol for the night. As they lined up to go the guy on point asked if we wanted to walk out to the camp perimeter with them. Of course we did. I took his rifle and walked point while we all sang the Disney song, “Hi Ho, Hi Ho, it’s off to work we go…” When we got to the perimeter we waved goodbye to a bunch of smiles. I was on R&R in Sydney, Australia. While I was looking at a Harbor Cruise Poster in a travel agency store front window, one of the employees came out and asked if I would be interested in going on an evening cruise that night as their guest. They had signed up more GIs on R&R for the cruise than they had girls to keep them company. That seemed like fun and I was certainly comfortable talking to American soldiers. I was leaning on the rail of the boat when a guy approached me and asked where I got the timing chain I was wearing as a bracelet. He was a helicopter crew chief and was surprised to see the chain on a girl’s wrist. 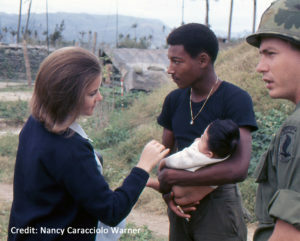 As we talked, he told me he had extended his tour of duty because he had no reason to return to the U.S. His wife and baby had been killed in a car accident during his first year in Vietnam and he was devastated. As we talked and shared stories our conversation became lighthearted, sharing laughs and enjoying each other’s company. When the cruise ended he told me for the first time since his wife and child had died, he was looking forward to going home. He had forgotten how much fun it was to spend time with an American girl. We parted there at the dock and I like to think he found happiness soon after he returned to the World.